One of the most common and easy to recognize plant diseases, powdery mildew, is caused by fungus spores that overwinter in garden debris and are spread by wind the following season. In late spring and early summer, the warmer days and high humidity provide perfect conditions for spore germination. The disease spreads over the surface of leaves of plants like Bee Balm, Lilac, Rose and Phlox. While the plant may look extremely unattractive, its overall health is not affected. Although we can’t change the conditions that favor powdery mildew, we can stop or slow its spread to keep your plants looking their best. Place susceptible plants in locations where they receive early morning sun. This allows the dew to dry quickly from their leaves to inhibit the spread of mildew spores. Increase the plants’ resistance by minimizing stress and providing adequate water, sun and soil requirements. 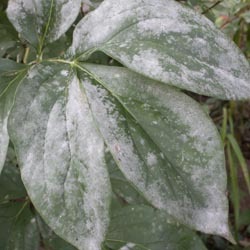 This will help the plants naturally resist powdery mildew and other common diseases. Give plants plenty of room for good air circulation. This helps leaves dry more quickly and lowers humidity so conditions are not as favorable for the mildew spores. Water the soil not the leaves of susceptible plants. Use soaker hoses, drip systems or watering wands to get water just to the base of the plant and out to the drip line without watering the foliage. Select mildew-resistant varieties of plants. These will vary in different areas and depend on your soil conditions and landscaping needs. Prevent the disease from effecting susceptible plants by spraying with a fungicide like Bonide Fung-onyl, Bonide Infuse Systemic Disease Control or Safer Garden Fungicide every 7-14 days while conditions are favorable. Always read fungicide labels completely before applying and follow instructions carefully to prevent mishaps that could damage your plants. Eliminate the breeding grounds for powdery mildew by cleaning up the garden and yard each fall, removing leaf litter, pruning branches and replacing old mulch. This will minimize the areas where spores can overwinter, reducing the chances of more mildew spreading in the spring. Powdery mildew may not be pretty, but it can be pretty easy to control if the right steps are taken to protect your plants. Using multiple techniques will be the most effective way to reduce the spread of the mildew and keep it under control or completely eliminated so your plants always look their best.